It is never a good feeling to drive with a flat tire. However, the good news is that it is relatively easy to replace one. The first step in the process is to elevate the vehicle using a jack that should be in the trunk of your car. 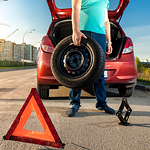 Once the vehicle has been elevated, remove the lug nuts from the wheel and remove it from the vehicle. You then place the new tire on the car, put the lug nuts back in and dispose of the old tire. If you have a donut tire for a spare, drive to Evergreen Subaru or another service center. The spare tire can then be replaced by one that matches the others currently on your car or truck. Typically, you can drive up to 55 miles on a donut without putting your car out of alignment or doing other damage.